Washington – The pact between congressional Democrats and President Donald Trump to temporarily end a 35-day partial government shutdown is more of a truce than the end of hostilities. 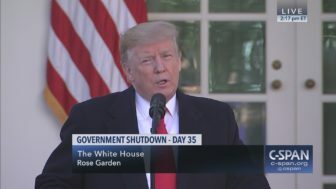 The agreement, announced by Trump Friday afternoon from the Rose Garden at the White House, will allow about 1,500 federal employees in Connecticut affected by the shutdown to receive all back pay due them. As soon Trump announced the deal, labor unions representing federal workers demanded the government make a “special run” to provide paychecks for those who have worked, or been furloughed without pay for weeks. The “Government Employee Fair Treatment Act,” passed by Congress and signed into law on Jan. 16, requires federal employees affected by the shutdown to receive their back pay at the “earliest date possible” after the government reopens, regardless of the next regular scheduled pay date. If so, federal workers could receive their back pay as soon as Wednesday. “As the shutdown created more suffering for hardworking people by the day, we are relieved that the government is set to reopen but we will not give up the fight until our members get the back pay the president promised and they deserve,” said Juan Hernandez, Vice-President of 32BJ Service Employees International Union Connecticut. Congress on Friday rushed to send a bill that would end the shutdown until Feb. 15 to the president’s desk. The reopening of the federal government will restart grants to Connecticut non-profits and government agencies and restart a number of services that have been unavailable. But the legislation does not contain any money for Trump’s border wall, allowing instead for negotiations on that issue. “If we don’t get a fair deal from Congress, the government will either shut down on Feb. 15 again or I will use the powers afforded to me under the laws and the Constitution of the United States to address this emergency,” Trump said, referring to his potential use of executive power to fund the border wall as a matter of national security. Still, Trump blinked after the Federal Aviation Administration temporarily halted flights into New York’s LaGuardia Airport on Friday because of a shortage of air-traffic controllers, a disruption that cascaded through East Coast airports such as Newark Liberty International and Philadelphia International Airport. “The shutdown needs to be brought to conclusion,” Dillon said. Coordinated sickouts by thousands of Internal Revenue Service agents tasked with processing tax refunds without pay also raised the political stakes over the shutdown, as did public sympathy for the hardships experienced by unpaid federal workers. The shutdown began on Dec. 22 after congressional Democrats and Trump could not agree on border wall funding and appropriations lapsed for nine major government agencies and several smaller ones. Connecticut’s Democratic lawmakers lauded the temporary return to normalcy offered by the agreement. “Regardless, our state agencies will continue contingency planning so we’re prepared to support Connecticut federal workers and taxpayers alike,” Lamont said. Trump said that a congressional conference committee would spend the next three weeks working in a bipartisan fashion to come up with a border security package. The bipartisan panel is expected to be composed of members of the House and Senate Appropriations Committees. But it wasn’t immediately clear Friday if Connecticut’s members of those panels, DeLauro and Sen. Chris Murphy, will be involved. Speculation on a deal that would reopen the federal government permanently includes funding for what Democrats call “fencing,” and perhaps a bill to protect young immigrants known as Dreamers and other immigrants who are slated to lose their protections from deportation. Some Democrats blasted Trump for not accepting earlier proposals that would have temporarily kept the federal government open. “So Trump is agreeing to the EXACT SAME DEAL he rejected 35 days ago. What a debacle. I’m so, so sorry, America,” Murphy tweeted. Meanwhile, Republicans sought to portray the breakthrough as a softening of the Democratic position on the shutdown.